There are some great questions coming in to Ask a Scienceblogger! If you (or your kids?) have a question you want answered by a scienceblogger drop by Page 3.14 (the blog of the SB overlordz) and leave your question in the comments on this post. It's said that the left hemisphere of the brain controls the right half of the body and vice versa. Does this apply to the processing of audio and visual stimulus of the ears and eyes as well? Does the left half of the brain process what the right eye sees and vice versa? When it comes to initiating motor actions, does each hemisphere of the brain control the opposite side of the body? When it comes to tactile sensations (i.e. touch), does each hemisphere of the brain receive signals from the opposite side of the body? Does the auditory input into the left ear get processed by the right hemisphere? Does the input into the right ear get processed by the left hemisphere? Does the visual input from the left eye get processed by the right hemisphere? Does the input from the right eye get processed by the left hemisphere? Let's address each of these separately. If you've ever looked at picture of a brain before (or, if you're lucky, a real brain), you probably know that since there's a lot of brain to fit into the skull, it's all folded into itself. By being so folded, the surface area of the brain can increase without substantially increasing the overall volume of the brain. The convex parts of the folds are called gyri (singular, gyrus). The gyri are separated by narrow grooves called sulci (singular, sulcus). The precentral gyrus is also known as the motor cortex or primary motor area, because its function is the execution of voluntary movements. The motor cortex controls the more than six hundred muscles involved in voluntary movements, and can be found at the rear of the frontal lobe, just in front of the central sulcus. 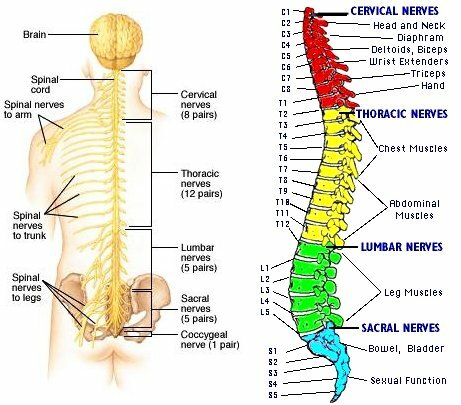 Those six hundred muscles are controlled by 31 spinal nerves. The postcentral gyrus is also known as the somatosensory cortex, or primary sensory area, because it receives sensory input from the body. The somatosensory cortex can be found at the front of the parietal lobe, just behind the central sulcus. Figure 3: Organization of the sensory and motor cortices, starting with the toes on the inside surface of the hemisphere, wrapping around towards the face, tongue, and throat on the outside surface. The sensory and motor cortices are actually highly organized - each part of it corresponds to a specific part of the body, and the size of the area devoted to each part of the body depends on the complexity of the movements that are carried out, or the sensations processed, by that body part. What that means is that the part of the motor cortex that controls the fingers is way bigger than the part of the motor cortex devoted to the torso, even the your torso is way bigger than your fingers. Likewise, the area of the sensory cortex that processes sensation from your lips is bigger than the part that processes sensation from your feet, even though your feet are bigger than your lips. Figure 4: And if you built a body that according to the proportion of motor or sensory cortex devoted to each part of the body, it would look something like this. So if you decide you want to move your right arm, or your right leg, the signal would leave the motor cortex of the left hemisphere, travel down towards your brainstem, and then at the level of the medulla, it would decussate, or cross over to the right side of the brainstem, and then continue into your spinal cord. Likewise if you wanted to move your left arm, the signal would leave your right hemisphere's motor cortex, decussate at the level of the medulla, and then continue in the left side of your spinal cord. So if you severed a nerve bundle below the level of the medulla that you knew to be involved in the execution of motor commands, then the side of your body that would become paralyzed would be ipsilateral - the same side of the body in which the lesion occurred. However, if you had a lesion higher in your brainstem, above the level of the medula, or if you suffered a stroke that affected part of your motor cortex, then the affected part of the body would be contralateral - the opposite side of the body as the lesion. The same pattern is true for the somatosensory cortex as well. So broadly, Tyler was correct, the right motor and sensory strips control the left side of the body, and vice versa. But, there are some exceptions, when it comes to the twelve cranial nerves. Almost all of the cranial nerves receive bilateral innervation. This means that both the left and right members of a pair of cranial nerves are innervated by the motor cortex of both the left and right hemispheres. The redundancy is a safety mechanism. If there was a lesion on only the left side of the brain, both sides of the body areas connected to cranial nerves would continue to receive motor messages from the right hemisphere. The signal would not be as strong as it was before, but this prevents full paralysis. There are also two exceptions to this exception: cranial nerve 12 that controls the muscles that allow you to stick out your tongue, and part of cranial nerve 7 that controls the muscles of your lower face both send and receive signals to the opposite hemisphere, like the rest of the body. In general, as with the rest of the body, it is true that the primary auditory cortex of each hemisphere processes input from the opposite ear. So sounds coming into the left ear are processed by the right hemisphere, and vice versa. The primary auditory cortex can be found on the surface of the temporal lobes. However, that's only a simplified diagram. If you go back and examine figure 5, above, you'll notice that the signals from the ears are carried by cranial nerve eight, the vestibulocochlear nerve, which controls the inner ear, and cranial nerve ten, the vagus nerve, which controls, among other things, the outer ear. Since cranial nerves communicate with both the left and right hemispheres, then the primary auditory cortices do receive input from both ears, though most of the input is from the contralateral ear. Again, this is designed as a safety mechanism. If there was a lesion affecting only the left auditory cortex, the right ear would not become entirely deaf. Here is where I think things get interesting. If you've been paying attention, you'll remember that each of the cranial nerves (with exceptions) communicate with both the right and left hemispheres, unlike the spinal nerves, which communicate with opposite hemispheres. So the quick answer is that visual information from each of the optic nerves (cranial nerve 2), gets processed by both hemispheres. But let's look a little closer at the optic nerves. If you inspect the image, you'll notice that each eye sends data from the retina back to both hemispheres, so that the right visual cortex processes data from both the right and left eyes, as does the left visual cortex. Some of the nerves decussate (cross) at the optic chiasm, but some of them don't. It actually gets a little bit more complicated. Each of your eyes, and thus each of your retinas (which is the part of the eye that receives the visual input), can be split in half: the temporal part, which is on the outside, (the right part of your right retina, and the left part of your left retina), and the nasal part, which is on the inside, near your nose (the left part of your right retina, and the right part of your left retina). Notice that the light coming into your eyes from the left half of the scene interacts with the temporal part of the right retina, and the nasal part of the left retina. The light coming at your eyes from the right half of the scene stimulates the temporal part of the left retina, and the nasal part of the right retina. 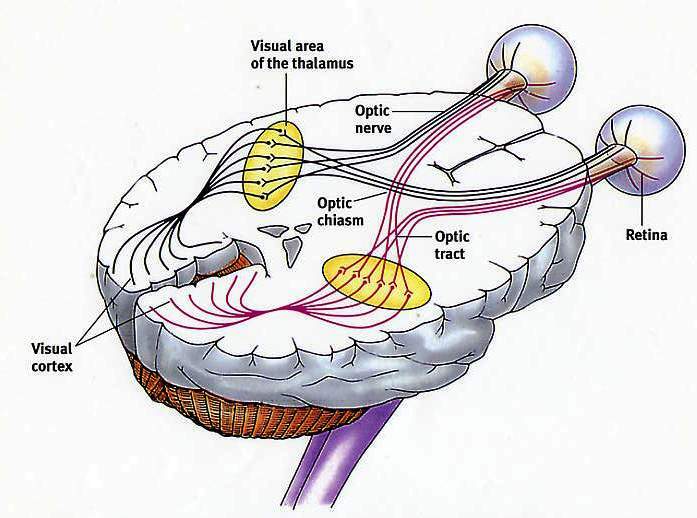 When the nerves partially decussate across the optic chiasm, the sensory input from the left half of the visual field combines and continues into the right hemisphere. The sensory input from the right visual field combines and continues into the left hemisphere. So each hemisphere doesn't process visual input from the opposite retina, but from the opposite visual field. The right visual field, initially split across both of your eyes, combines and gets processed by the left visual cortex. The left visual field likewise gets processed by the right visual cortex.